Carrying liquids up a hill usually involves a pump, or a lot of buckets. But now it seems water can do some of the heavy lifting itself. Chinese researchers have created a tiny water pump that requires no power source. In other words, it can push water upward without adding energy. A copper mesh treated with an alkali solution creates a hydrophobic surface, one that repels water. That keeps the liquid moving along. But it takes placing a few drops of water underneath the mesh to coax it to move the water out of the pipe entirely. It may seem like magic, but it's all thanks to the surface tension of water. 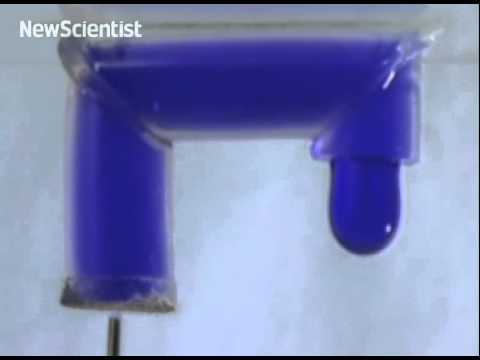 When the droplet touches the larger column of water, this surface tension breaks and the energy used to keep the droplet spherical goes into lifting the water. "We thought, why not use water's own energy to propel the antigravity delivery?" says Liu.